TOTAL KNEE REPLACEMENT CENTER AT NANESH HOSPITAL Total Knee replacement is a surgical procedure where the diseased knee is replaced with Artificial Knee Joint (implant). WHEN DO YOU NEED TOTAL KNEE REPLACEMENT? • If you are more than 55yrs of age, with severe knee pain that limits your daily activities like walking, using stairs etc. BENEFITS OF TOTAL KNEE REPLACEMENT: 1. Relief of Pain. 2. Increased movement of the joints. 3. Correction of deformity, meaning straight leg. 4. More leg strength (if you do exercise regularly). 5. Improved quality of life. 6. Ability to return to normal life. 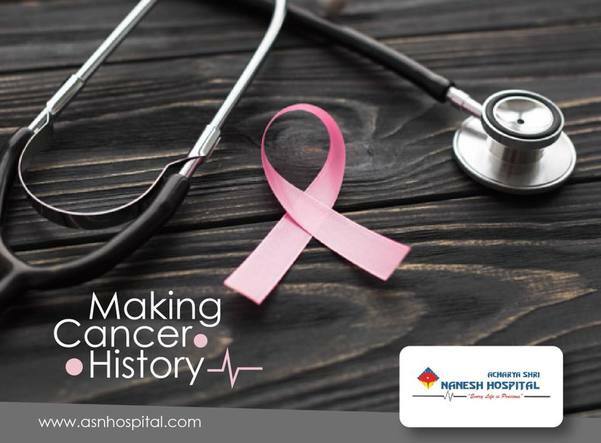 The best Chemotherapy center in Navi Mumbai. Acharya Shri Nanesh Hospital, CBD Belapur is offering best Chemotherapy services at affordable cost. What is chemotherapy? Chemotherapy uses anti-cancer drugs to destroy cancer cells. Cytotoxic means toxic to cells. Cytotoxic chemotherapy drugs disrupt the way cancer cells grow & divide but also affect normal cells. These healthy cells can usually repair damage caused by chemotherapy but cancer cells can't & eventually die. Successful CANCER surgery at Nanesh Hospital. Dr.Mishil Parikh-a former TATA hospital Ortho Cancer Surgeon suuccessfuly operated a 60 year old patientwith Liposarcoma at Nanesh Hospital, CBD Belapur, Navi Mumbai & gave a new life to this patient. Case- 60 year old male with history of swelling in right posterior thigh since 6 months. Diagnosis : Liposarcoma Status: Non Metastatic Tumor was encasing the sciatic nerve and femoral vessels in the distal femoral canal. Since it was a well differentiated liposarcoma, surgery could afford to go marginal and save the nerve and the vessels. Surgery took around 2 hours and the tumor was resected in one single piece. All vital structures were preserved and uninjured. Tumor of 22 x 6 x 5 was removed weighing around 3kgs Patient started walking the next day and has resumed normal life.